Learn how to write a sonnet in iambic pentameter, just like Shakespeare did. Discover the rhythm and rhyme scheme of the quatrains and couplets that make up a Shakespearean sonnet. Select a subject to write your poem about (Shakespearean sonnets are traditionally grounded as love poems). Write your lines in iambic pentameter (duh-DUH-duh-DUH-duh-DUH-duh-DUH-duh-DUH. Write in one of various standard rhyme schemes (Shakespearean, Petrarchan, or Spenserian). Format the sonnet using 3 quatrains followed by 1 couplet. Compose your sonnet as an argument that builds up as it moves from one metaphor to the next. Ensure your poem is exactly 14 lines. Every A rhymes with every A, every B rhymes with every B, and so forth. You’ll notice this type of sonnet consists of three quatrains (that is, four consecutive lines of verse that make up a stanza or division of lines in a poem) and one couplet (two consecutive rhyming lines of verse). First quatrain: An exposition of the main theme and main metaphor. Second quatrain: Theme and metaphor extended or complicated; often, some imaginative example is given. Third quatrain: Peripeteia (a twist or conflict), often introduced by a “but” (very often leading off the ninth line). Couplet: Summarizes and leaves the reader with a new, concluding image. When in eternal lines to time thou growest. First quatrain: Shakespeare establishes the theme of comparing “thou” (or “you”) to a summer’s day, and why to do so is a bad idea. The metaphor is made by comparing his beloved to summer itself. Second quatrain: Shakespeare extends the theme, explaining why even the sun, supposed to be so great, gets obscured sometimes, and why everything that’s beautiful decays from beauty sooner or later. He has shifted the metaphor: In the first quatrain, it was “summer” in general, and now he’s comparing the sun and “every fair,” every beautiful thing, to his beloved. Third quatrain: Here the argument takes a big left turn with the familiar “But.” Shakespeare says that the main reason he won’t compare his beloved to summer is that summer dies — but she won’t. He refers to the first two quatrains — her “eternal summer” won’t fade, and she won’t “lose possession” of the “fair” (the beauty) she possesses. So, he keeps the metaphors going, but in a different direction. And for good measure, he throws in a negative version of all the sunshine in this poem — the “shade” of death, which, evidently, his beloved won’t have to worry about. Couplet: How is his beloved going to escape death? In Shakespeare’s poetry, which will keep her alive as long as people breathe or see. This bold statement gives closure to the whole argument — it’s a surprise. And so far, Shakespeare’s sonnet has done what he promised it would! 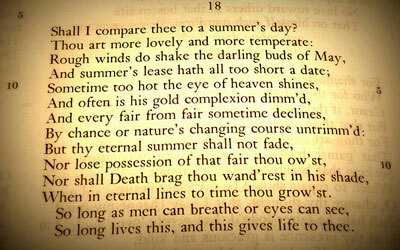 See how tightly this sonnet is written, how complex, yet well-organized it is? Now that you know how to write a sonnet, try writing one your own! Shows you how much you can pack into a short form. Gives you practice with rhyme, meter, structure, metaphor, and argument. Connects you with one of the oldest traditions in English poetry — one still vital today.